The museum was established in 1948, in the house of Tasala. The house itself was built by Edla and Matti Lampela Niemelä from Lampela, the Old Salla. The main building of Tasala house was completed in October 1948. It was bolted Kalle Leinonen, the son-in-law of the house, with his brother Aarne Leinonen. Kalle and Matti, the son of landlord Matti, finished the work until the house was habitable. The building was constructed according to the drafts of Farming Society Association. The museum house is owned by Seppo Leinonen, the grandson of Edla and Matti. He started assembling and building the house into a museum after buying it in 1998. The reconstruction museum of Matti the land keeper, was built in a former cowshed in 2002. The walls were bolted of sawn pinewood logs, and the corners have special mortises. Barring was made by Kauko Kantala from Paloperä, Salla. Afterwards, the walls were carved with an axe, and they were not treated with any substance, though plank floor made of spruce was treated with flax oil. A cow house was built in the same way earlier in 1949, though its ceiling was lower. It was bolted by Pauli Onkamo and Matti Heikki Niemelä. The plans of the cow house were sketched on a paper by Juho Kaaleppi Niemelä, brother of Matti Jalmari Niemelä, a farmer. Juho Kaaleppi Niemelä built a similar cowshed in his own house, too. The kitchen and lavatory were built in a place, where there was previously a horse stable. In a hay barn there are all the harnesses for the horses, for both winter and summertime on display. There are also all kinds of tools and items that were needed in a farmhouse in the 1940’s and 1960's: Fishing implements, scythes, hayforks, axe blades, compass saws, toolboxes, horseshoes, pole bells, cow bells and cooking device. Old porcelain dishes from the 50's, enamel dishes, sheet metal dishes and glass dishes. On a porch there are articles needed for milk processing, like sour whole milk casks, a tub used for salting and preserving butter, first milk churns and dough tub. Many of these objects were given by the two sisters, Laila Pajari and Maila Tervonen from Kursu. The tools were used every day in different kinds of tasks by their parents, Eino and Tyyne Pajari. Other donations were made by Anna-Liisa Lampela from Lapajärvi, Sirkka and Heikki Iivari from Salla, and Pekka Lampela from Lapajärvi. In addition, original articles of Tasala are shown in the exhibition. Photos placed on the walls in the old log house show the old village of Salla and Salla fell, and the church of old Salla, which was burnt by the Finns in 1939, when retreating in the Winter War. In the third picture one can see people from Lampela sitting on a porch, in the left hand side there is sitting the matron Anna Kreeta Lampela. On a yard side wall there are photos of the farmers, sons and hostesses of Tasala. The table and the chairs in the farmhouse living-room are original. Furnishings in the living-room are restored in the original 1950's style of the house, in colours and textiles. In the attic there are articles, which belong to young hostess Nanni Niemelä. The cupboard is bought from Kokkola during the evacuation, when Nanni and Matti Heikki were engaged. The sewing machine is Nanni's too, as well as the sink. The dishes belong to the house. There are also wooden albums, photos, and tablecloths and drapes from the 1950's. Tablecloths with embroidery are sewed by the oldest daughter of the house, Helvi. 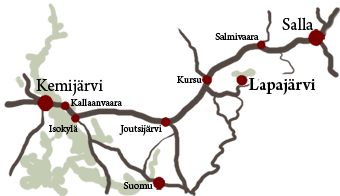 She lived in the Soviet Union for 24 years and came back to Lapajärvi in 1956.